Particle size reduction of recyclable materials during the shredding of modern end-of-life products plays an important role in the composition (and quality) of the intermediate recycling streams and the ultimate material recovery and therefore recycling rate. In order to transfer valuable waste materials into reusable materials, that can be reused as secondary raw materials, a perfectly functioning, robust technology with specified material preparation and designed for continuous operation is needed. This Technology Zones offers an insight into the latest innovations in (technologically advanced) size reduction solutions. VELBERT – In the seventies, it was waste disposal and management which required new solutions when Germany turned into a throwaway society. At that time, Doppstadt started developing machine solutions for the shredding, screening and washing of various materials such garbage, industrial waste, biowaste, waste wood and excavated earth – thus helping to solve the global waste problem. JYVÄSKYLÄ – The cement and lime industry is now looking into alternative fuels as a solution for global environmental issues. In order to succeed, the sustainability approach must be supported by economic incentives. Tire-derived fuel presents a cost-efficient alternative for fossil fuels and can increase the profits of cement manufacturers. SARASOTA, FL – CM Shredders, a leading manufacturer of the worlds most advanced industrial shredders and recycling systems, will open its new test lab and R&D demo facility in North America. Located at its headquarters in Sarasota, Florida, the new 4000 ft2 R&D, and demo facility will feature an array of both single shaft and dual shaft shredding systems from the company’s versatile product range. Daly Plastics is one of the largest plastics waste processing companies in the Netherlands. At the Zutphen site, the subsidiary Caroda Polymer Recovery recycles agricultural and packaging films. The aim is to produce regranulates of the same quality as virgin material. That requires innovative solutions. Two Jupiter 2200 and four Micromat 2000 shredders from Lindner Recyclingtech provide the recovery facility with the ideal particle size. ITS has supplied a granulator model ITS170/67, installed as part of a complete tyre recycling facility designed to recycle 25,000 ton of tyre per year. The ITS170/67 was selected because it has an extremely low total granulating function cost, reduced maintenance and operational costs therefore increased productivity, providing increased revenue per hour. Danish manufacturer of recycling equipment, ELDAN Recycling, has launched a new Twin Shaft Clean-Cut Shredder (TSCC) for production of clean-cut tyre chips from car or truck tyres. Andrea Falco (HSM GmbH + Co. KG)Andrea Falco began his career over 15 years ago in the Office Technology sector, taking on a variety of management roles during his career. For almost 3 years, Andrea Falco has been responsible for the distribution of baling presses and systems for recyclable materials. He and his teams in the European branches of HSM GmbH + Co. KG are the right contacts, especially when it comes to volume reduction, optimization of disposal logistics and data protection. In addition to the sales expertise, HSM offers extended customer services, such as specialist advice from experienced project engineers and a world-wide service network of own service technicians or partner companies. The Grand Slam™ Horizontal Shaft Impactor (HSI) is a versatile crusher design that can solve many size reduction problems including the recycling of highway asphalt. The 48×60 GS can process Recycled Asphalt Pavement (RAP) at 300 tons per hour at standard settings, with the capability for more. Secure IT Disposals (SITD) provide world class secure data destruction services, IT disposal, auditing and IT recycling. SITD are accredited to ISO 9001, 14001, 27001, NCSC CAS-S, ADISA, DIPCOG, etc as well as approved by the MOD (Ministry of Defence) and other government departments to destroy data at the highest security levels. Leading Experts with over 18 years experience in providing asset disposal and data destruction services to Top Secret level. All types of hardware and media can be sanitised or destroyed. 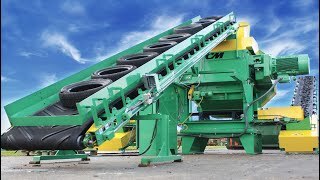 CM Recycling Solutions, Sarasota Florida – A world-leading manufacturer of tire recycling systems is proud to announce the sale and commissioning of a new turnkey CM whole tire-to-chip system to Badger Materials Recycling. In the waste wood processing industry, railway sleepers are among the most difficult materials to shred. They are made of very hard wood and often still contain iron screws and plates. When Gojer, Kärntner Entsorgungsdienst GmbH was faced with the challenge of shredding these sleepers, they opted for the Urraco 95 DK mobile twin-shaft shredder from Lindner-Recyclingtech at the end of August 2017. How does the 770 HP mobile machine perform in terms of throughput, energy consumption and efficiency? Gojer looks back on a very positive first year.